Stanford Advanced Materials (SAM) provides high quality powder consisting of alumina and 3% titanium oxide for thermal spraying. Related products: Aluminum Oxide (Alumina, Al2O3), Aluminum Oxide 13% Titanium Oxide, Aluminum Silicate (Mullite, 3Al2O3•2SiO2), Aluminum Oxide 40% Titanium Oxide, etc. 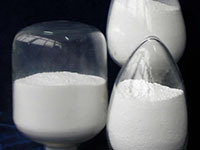 Alumina powder adding a small amount of titanium oxide can produce coatings with higher toughness, abrasion and erosion resistant.